Standing in for Howie is a super cheesy announcer guy which is somehow fitting since Deal or No Thanks feels like a pretty low rent production overall. Cheapness aside, though, it does do a faithful job of recreating the rules of the actual TV game show even if the action kind of plods along with the opening of each dollar amount. There’s really not much more to say about this one except that if you’re a fan of Deal or No Deal you’ll probably have a little fun with this game. 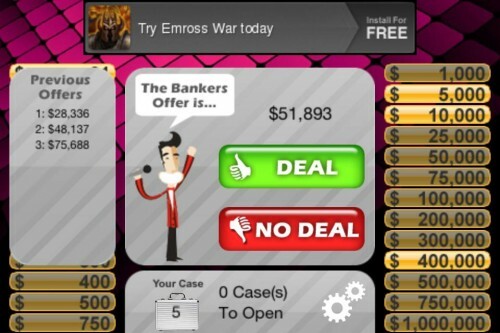 Obviously you won’t be winning any real money, but if getting onto the OpenFeint scoreboard excites you then you might actually have an incentive to hit the green “deal” button before you get down to the last unopened briefcase. Replay Value Um… a little?